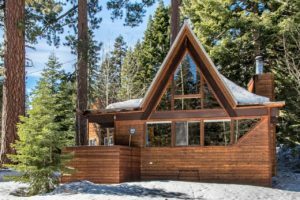 This charming Tahoe Cabin is set in the towering Jeffrey pines of Alpine Meadows, but this little gem is light, bright and airy. A perfect getaway for all seasons, and ideal for ski enthusiasts, located 1.2 miles from Alpine Meadows ski resort. In summer, spectacular mountain biking, hiking and trail running opportunities abound. World-class hiking on the Five Lakes Trail into Granite Chief Wilderness is only moments from your door. Don’t let the 1-bedroom status throw you off; the loft is very spacious, private and comfortable. This is a great find at this price! The owners have taken wonderful care of “Die Hutte” (the cabin) and it is immaculate, with fun decorative details. You will fall in love with the setting and the lot. You also have the option to join the AM Estates Assoc. for only $50/year with swimming pond, tennis courts and BBQ facility. 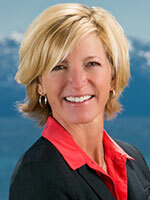 Only 10 minutes away is all that Lake Tahoe has to offer, along with dining, shopping, beaches & marinas in Tahoe City. Full Listing Details 1805 Deer Park Dr.